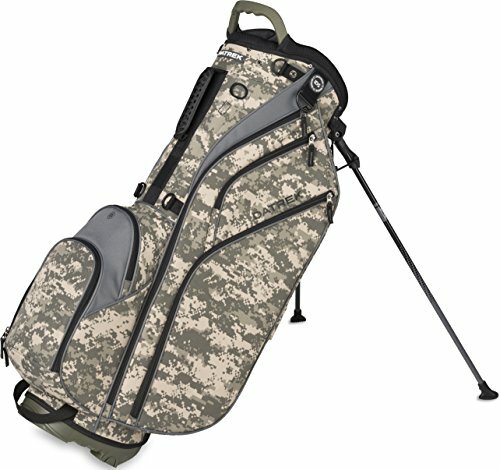 Camouflage golf bags have a certain unique level of style and appeal that can’t be matched by traditional golf bags. Apart from their exterior appeal, the best camo golf bags can also be in several other exciting color combinations. Innovative features such as multiple dedicated slots for your clubs and valuables. 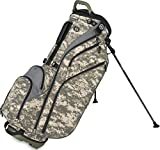 Buying the right camo golf bag however can be a tricky affair given the myriad options available. We’ve narrowed down three great options that will make you look great on the course. The TaylorMade Flextech camo stand golf bag is truly a showstopper. Its superior quality construction and availability in a wide range of color combinations, including royal and black. The bag is appointed with the new Flextech stand system. 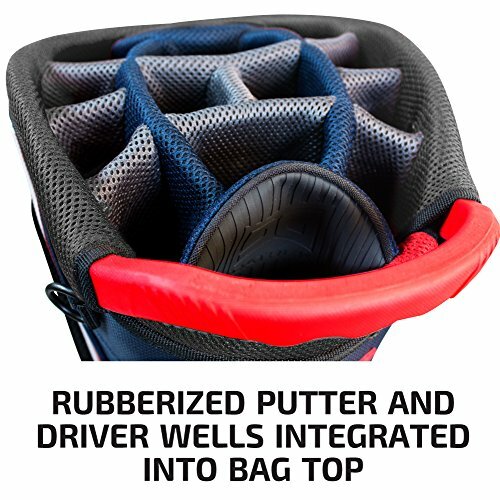 It's ensures your clubs don’t stick to the bottom of the bag thanks to its patented smooth release, collapsible base. In terms of spacing, the TaylorMade Flextech golf stand bag doesn’t disappoint. With 5 full length dividers at the top, and 11 well-spaced pockets to hold everything you may need on the course. Tipping the scales at just under 5 lbs, the bag is fitted with a dual-density comfort strap that is crafted from two sturdy materials for enhanced comfort and stability. The bag also features a top carry handle, webbing trunk handle, and an EVA ergonomically molded hip pad. This makes it a joy to carry across longer periods. Some of the pockets of the TaylorMade Flextech golf stand bag include a water resistant pocket with micro-suede lining for your valuables. A full length garment pocket, a ball pocket with zippered panel. An easy to access insulated water bottle pocket, a tee pocket and a rangefinder pocket. The Datrek Bad Boy Golf 2018 Go Lite Hybrid Stand Bag slots in at the #2 position for several good reasons. Starting with its 14-way full length divider top. Adding to this, the bag can be ordered in a choice of 10 colors including camo and navy. It features a soft grip oversized putter well and a driver well at the top of the bag. The Bad Boy Go Lite Hybrid Stand Bag is fitted with an easy grip handle at the top. Along with the integrated ergonomic double shoulder strap whichallows you to carry it around with ease. With regards to space, the Bad Boy Lite camo golf bag is equipped with 5 pockets. Including a fleece-lined valuables pocket, a large apparel pocket, an insulated beverage sleeve, and an oversized ball pocket. Weighing a little over 5 lbs, the Datrek Bad Boy Golf 2018 Go Lite Hybrid Stand Bag comes with a cart strap sleeve. This makes it easy to strap the bag to the golf cart. The bag is supported with a sturdy base and stand so it will stay put during your playing. If you’re looking for a camo golf bag that offers excellent features. This bag will perhaps last you for several seasons to come with proper maintenance. The Datrek Bad Boy camo golf bag is worth a second look. Callaway Golf is one of the biggest names in the golf gear space. The 2018 Org 14 Cart Bag is just another hit addition to the company’s product lineup. The bag comes with several innovative features, some often seen in only higher priced camo golf bags such as a magnetic rangefinder pocket. Additionally, the bag can be ordered in a choice of 7 appealing color combinations. Which include Black/ Silver/ White, Titanium/ White/ Neon Yellow, Navy/ Red/ White. Features a 14-way top with full length dividers and 2 easy to access valuables pockets and 2 insulated beverage pockets complete with drain ports. Weighing in at just 5.8 lbs, the ORG 14 camo bag by Callaway Golf even comes with a duel pen holder. It is equipped with a rain hood to protect your clubs in wet weather conditions. For a golf bag that offers a plethora of top-notch features and long service life when maintained properly. 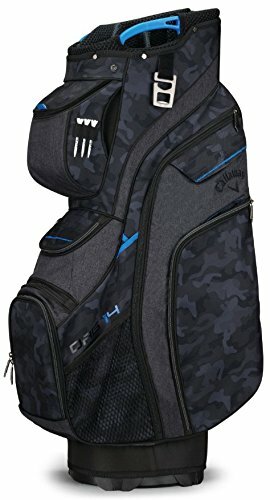 The Callaway Golf ORG 14 camo bag is an excellent option. Camo golf bags are a great departure from traditional golf bags that generally come in one solid color or a combination of two colors. 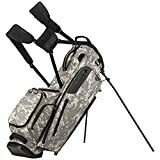 Shopping for the best camo golf bag can be a daunting task given the many options available, each with their own set of features and prices. The three camo golf bags mentioned on this list are some of the best available in this segment. They come with several great innovative features such as sturdy stands for optimal support when set down. Furthermore, all three bags can be ordered in a choice of several great color combinations. Including navy blue and titanium and come with several generously spaced pockets to accommodate your essentials. If you aren’t going to be hauling around too many clubs, the TaylorMade Flextech stand bag is a great choice. If you are going to be carrying a full set of clubs? The Callaway Golf Org 14 camo bag and TaylorMade Flextech stand bag are unmatched options for their 14-way full length divider tops. All three options are fitted with plush padded straps and grip handles. You can carry them around for longer periods without causing any strain on your shoulders and back.